Never has US intentions in Asia been so obvious. Attempts to portray America’s role in the region as constructive or necessary have been ongoing since the end of World War II, however, recently, with Asia able to begin determining its own destiny for itself, the tone from Washington has become increasingly curt and direct. 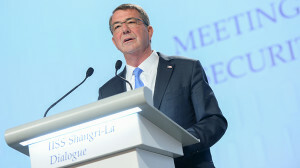 US Secretary of Defense Ashton Carter’s remarks during the Shangri-La Dialogue in Singapore were all but a proclamation of US hegemony over Asia – a region of the planet quite literally an ocean away from Washington. “I hope that this development doesn’t occur, because it will result in actions being taken by the both United States and … by others in the region which would have the effect of not only increasing tensions but isolating China,” Carter told the Shangri-La Dialogue, a regional security forum in Singapore. The term, “isolation” is key – and has defined US foreign policy toward rising powers in Asia since before even World War II. Robert Blackwill, a former US ambassador, a senior fellow at the Council of Foreign Relations (CFR), a lobbyist, and US National Security Council Deputy for Iraq during the US invasion and occupation in 2003, penned last year a paper for the CFR titled, “Revising U.S. Grand Strategy Toward China” (.pdf), in which no secret was made about US designs toward Asia Pacific. …preserving U.S. primacy in the global system ought to remain the central objective of U.S. grand strategy in the twenty-first century. Sustaining this status in the face of rising Chinese power requires, among other things, revitalizing the U.S. economy to nurture those disruptive innovations that bestow on the United States asymmetric economic advantages over others; creating new preferential trading arrangements among U.S. friends and allies to increase their mutual gains through instruments that consciously exclude China; recreating a technology-control regime involving U.S. allies that prevents China from acquiring military and strategic capabilities enabling it to inflict “high-leverage strategic harm” on the United States and its partners; concertedly building up the power-political capacities of U.S. friends and allies on China’s periphery; and improving the capability of U.S. military forces to effectively project power along the Asian rimlands despite any Chinese opposition—all while continuing to work with China in the diverse ways that befit its importance to U.S. national interests. It should be noted that in particular, the point regarding “concertedly building up the power-political capacities of U.S. friends and allies on China’s periphery” is not as innocuous as it sounds. Blackwill himself in his capacity as a lobbyist represented one of those “friends and allies on China’s periphery,” the client regime of Thaksin Shinawatra in Southeast Asia’s nation of Thailand. Shinawtra while in power, would send Thai troops to aid in America’s illegal invasion and occupation of Iraq, hosted the CIA’s abhorrent rendition program within Thai territory, and attempted to ramrod through a US-Thai free trade agreement – all at the expense of Thailand’s best interests. Shinawatra’s attempts to turn Thailand into a client state of Wall Street and Washington interests eventually unraveled into a bloody political conflict that continues even today. Shinawatra would be ultimately ousted from power, but US interests have continued to work to put him or a similar proxy into power, while undermining and attempting to destroy Thailand’s own existing political order and institutions. In reality, “building up the power-political capacities of U.S. friends and allies on China’s periphery” actually means toppling sovereign governments and replacing them with obedient client regimes to be used in Washington’s proxy war with Beijing – at the cost of the client regime’s own peace, stability, and prosperity. Indeed, throughout Asia, the realist understanding of a need to balance power between a rising China and the rest of Asia has guided the economic and military expansion of China’s neighbors. It is done, however, independently of US ambitions and done with maintaining good relations with Beijing. The US has openly stated that its goal is to maintain primacy in Asia – and aims at isolating and containing China’s rise. This is entirely inconsistent with the best interests of each and every nation along China’s periphery. Secretary Ashton Carter and Robert Blackwill’s admissions of US policy in Asia are only the most recent affirmations of a long-running policy of containment that stretches back to the 1950s, the Vietnam War, and has continued onward to this very day. The infamously leaked “Pentagon Papers,” a secret Department of Defense study of America’s involvement in Vietnam from 1945 to 1967 put together by then Secretary of Defense Robert McNamara in 1967, would reveal US military force being used more directly in America’s continued attempts to contain China. It is clear that from the conclusion of World War II up to and including today, the goal of containing China has dominated America’s foreign policy in Asia. It has included proxy wars as admitted to by the US State Department in the 1950’s in Tibet, full-scale war as seen in Vietnam during the 1960’s, and the creation of client regimes with which to confront China more recently from 2001-2006 under Thaksin Shinawatra and now fully manifested as a costly political crisis still undermining peace and stability in Thailand today. A similar client regime is in the process of taking power in Myanmar under Aung San Suu Kyi – quite literally a creation and perpetuation of US and British funding and political support. Malaysia has been targeted by political instability through US-proxy Anwar Ibrahim, and the Philippines have long been subordinate to US foreign policy for over a century. Placing this all on a map, and including the US occupation of Afghanistan – which borders China’s west – and efforts even within China’s borders to subvert political order and stability, a geopolitical ring virtually surrounds China from west to east. It is worth repeating that Asia is already rebalancing accordingly to China’s growing regional influence. However, nations along China’s periphery can already be seen benefiting from this rise as well. Working with China across a wide range of areas from economics to military cooperation are directly benefiting China’s neighbors. The region – it appears – seeks to strike a balance of power but within a non-confrontational, cooperative regional order. The United States – as an opportunist – seeks to pose as assisting in the creation of this regional order, but with its recent proclamations, is clearly aiming to isolate China by deliberately inflaming tensions everywhere from Myanmar regarding ongoing Chinese-constructed infrastructure projects, to the South China Sea, to the Korean Peninsula. The process of isolating and hindering the rise of China will not just cost Beijing – it will cost all of Asia – even if the risks and costs of confrontations the US is cultivating within Asia are negated. However, considering these US-engineered and encouraged confrontations – nations are being prodded into expending resources and political goodwill to fulfill Washington’s own self-serving regional ambitions. For Asia’s leaders it is important for them to continue on constructive and cooperative means of striking a balance of power between a rising China and the rest of Asia. This must be done while incrementally displacing America’s unwarranted and malicious influence in the region. This does not mean isolating the United States as it seeks to isolate China – but only isolating it to the extent that the US concedes to maintaining normal ties with Asia predicated on equality, not hegemony. Asian security is no more the United States’ to underwrite as American security is Asia’s to underwrite. Making this clear to US policymakers and the special interests they serve is essential in establishing the fact that no nation is “exceptional” and for any real “international order” to exist, impartial and objective standards must be applied to all – whether they reside in Washington or Beijing, or beyond.